I want to ask you to give rise to the attitude of an awakened heart before receiving the sacred Dharma teachings. There are two kinds of intentions one can have, virtuous and unvirtuous. An unvirtuous attitude is thinking of oneself only while living at the expense of others. The motivation we generate is the wish to develop and attain wisdom and compassion for the benefit of all sentient beings together with the resolve to engage in the practices that are necessary to accomplish this. There are two ways to replace unvirtuous intentions with a virtuous motivation. One can recognize that negative thoughts and actions harm oneself as well as others and switch one’s attitude to benefit oneself through virtue instead of vice. There is nothing wrong with thinking of one’s own well-being by being good, but it is a rather meagre and narrow-minded attitude; it is that of Hinayana followers, who pursue their own freedom from inadequacies that cyclic existence always entails. The motivation of Mahayana followers is more profound and far-reaching; it is the wish to attain wisdom and compassion in this and all future lives for the well-being of all sentient beings. If a disciple of the sacred Buddhadharma has distinguished the consequences of virtue and vice, i.e., has realized that negative actions of body, speech, and mind harm oneself and others, then he or she begins practicing the paramitas, the unsurpassable and outstanding activities of a Mahayana practitioner. Paramita is a Sanskrit term and means “perfection.” By practicing the six perfections, the benefits one experiences oneself and the help one can give others are immeasurable and immense. The six paramitas are generosity, ethics, patience, joyful endeavour, meditative concentration, and discriminating awareness. There are many opportunities to practice the first paramita of generosity. It means being charitable according to one’s abilities; it doesn’t mean handing over a large sum of money or giving away one’s entire provisions and possessions. Offering one’s time by just listening to someone who has trouble dealing with problems, for example, is an act of generosity. Knowledgeable individuals who present Dharma instructions to others are also being very generous, since giving the sacred Dharma is the best kind of generosity. Yet, one must be careful, seeing that giving the teachings presupposes that one has understood them well. As long as someone feels insecure and still has doubts, it is much better to discuss questions with an authentic and qualified Lama before sharing these very profound subjects with others. Should one do so anyway, one would resemble a person without eyesight guiding someone who is blind - this must be avoided. Even though one’s motivation may be good, it is incorrect to think one can teach the Dharma as long as one hasn’t fully understood the precious teachings oneself. Therefore, great saints and sages of the past warned us and said: “Trying to teach others while still incapable is deceptive and detrimental.” So, it is very important to be honest with oneself and careful when it comes to the sacred Dharma. These saints and sages also said that “Suffering will never end, because samsara is limitless and inexhaustible. There will always be an unimaginable number of sentient beings lost for help in the circle of life.” Therefore it is necessary to accomplish realization first so that one will not lead anyone astray and will correctly and reliably benefit others when one is truly qualified and able. The paramita of generosity is practiced in order to accumulate positive merit that one does need while treading the path, so it would be good to be generous, even on a small scale. One can start by placing little offerings on a shrine at home or bringing flowers and incense to a Dharma Centre. One offers pleasant and beautiful things with a pure motivation that is generated from the innermost centre of one’s heart and one dedicates the merit for the welfare of oneself and all living beings. If there is a Dharma Centre nearby, one goes there as often as possible, receives teachings from a Lama, participates in discussion groups, exchanges notes, works together to invite a Lama to return and present further teachings, and the like. It is said that one’s view becomes deeper while practicing the path, but that one’s behaviour must accord with set rules and regulations. Misbehaviour must be abandoned since it most certainly confuses others and harms. Therefore it is important to practice the second paramita, which is discipline or ethical behaviour. Discipline refers to studying and meditating the Dharma regularly and putting what one has learned into practice continuously. Even if pushed for time, as is usually the case in the West, one can find a little time every day to study and meditate for a short while with joyful endeavour, the third paramita. Difficulties do arise; for instance, one has trouble understanding a teaching, experiences obstacles while meditating, isn’t as kind as one would like to be, is confronted with jealousy, has disputes, and sometimes boils over with anger. It is important not to succumb to those instances but to observe one’s predicament and examine an emotion when it arises. One asks oneself, “Where did it come from? How does it move? Where does it go? What kind of emotion is this?” Instead of reacting to a disruptive feeling, one practices patience, the fourth paramita. Patience means regularly studying, reflecting, and meditating the precious Dharma and integrating the results that arise from daily practice into one’s life, which is the fifth paramita, meditative concentration. All five paramitas lead to the sixth, reflexive awareness. If a disciple practices the six paramitas according to a qualified Lama’s instructions with the altruistic motivation, then his or her loving kindness and compassion for all living beings will increase. The aspiration to truly be able to help others adequately and efficiently will inspire a follower to practice the path that leads to perfection. Whoever rushes and is in a hurry to teach the Dharma to others is in extreme danger of causing trouble for everyone involved. It is absolutely necessary that disciples earnestly check whether they have understood the Dharma well, especially the fundamental teachings, and to recognize whether they are capable of teaching others before doing so. If a disciple has mastered the teachings correctly, then there is nothing wrong with imparting instructions and answering questions, but it is important to be humble and modest. It would be better for you to recommend a visiting Lama than think you can teach the Dharma. At a certain stage on the path, disciples hear about what is translated as “emptiness.” The founding fathers of Madhyamaka wrote treatises about the Middle-Way School and expounded emptiness in great detail, and many sages of Tibetan Buddhism wrote commentaries to these texts for their pupils, even to this day. This can become dangerous, though, because the truth of emptiness has been misused throughout history as an excuse for one’s own laziness. We have all heard people repeat, “Everything is empty, so why bother and go to the trouble of studying and practicing?” As long as one has not realized emptiness and experienced it for oneself, talking about emptiness is nothing but an alibi to be lazy. Talking the talk and not walking the walk resembles the twitter of birds on treetops – it helps nobody. On the contrary, talking about emptiness only causes more problems that are so very hard to solve. So, please be careful there and don’t even consider teaching others this quite complex subject. If practitioners focus their attention on meditating Chenrezig and realize loving kindness and compassion correctly and fully, then realization of emptiness automatically and spontaneously arises within, because love and compassion and realization of emptiness are inseparable. Let us therefore concentrate our attention and practice what seems easy and simple, namely loving kindness and compassion, instead of spending so much time studying the complex philosophy of emptiness and the very long commentaries that explain it. Studying all these treatises that explain emptiness down to the last detail involves intellectual learning and doesn’t effect realization. Loving kindness and compassion, bodhcitta, can be increased by reflecting that all living beings were our caring mothers and fathers in past lives. We see that they are trapped in samsara, the never-ending cycle of suffering and pain, and – like us – strive and struggle to eliminate suffering and to experience joy. It is evident that the methods people resort to in order to achieve these goals are inadequate and not effective. On the contrary, faulty methods only entangle people more. Love and compassion inspire and encourage us to quickly acquire effective methods and means so that we can help all living beings who were once our kind parents. We do what we can to progress on the path as quickly as possible so that we acquire reliable means to help others adequately. In the process, we realize emptiness. Realizing emptiness means realizing that all appearances and experiences, i.e., all phenomena, are merely conditioned and therefore change, disintegrate, and end. Practitioners who are aware of emptiness see that all things are impermanent, have no real existence in the absolute sense, i.e., are empty of inherent existence. When approaching the teachings from the truth of emptiness, one realizes that living beings are stuck in samsara and cannot escape, because they think that suffering is permanent and real. One understands that they don’t contemplate the source of suffering and fear and become more entangled the more they seek freedom from anguish and pain. From whichever side a disciple approaches and practices the path, it is clear that loving kindness and emptiness are indivisible and cannot be separated or divided in two. If we look at the manifold ways that billions of human beings suffer, compassion automatically arises in us. If we think about how family members, friends, and people in foreign countries suffer, compassion arises in us. Whether strangers or friends, we know that so very many people live their lives ruled by delusion that arises from their emotions, and we know that the main delusion that brings on suffering is ignorance, i.e., not being aware of the infallible law of cause and effect. Those living in delusiveness are only interested in themselves and cause unbearable suffering and pain to themselves and others. Tears come to my eyes just thinking about how cruel and mean people can be. If one looks at the immense number of animals that can be seen with one’s eyes, they hardly differ from humans. Of course, one can argue that they protect their own species when they attack animals of prey and eat them up. Nevertheless, even though it might seem justified that animals kill each other in order to survive, their actions give rise to further suffering and pain. This is why the Dharma teaches that it is of utmost importance to generate and develop compassion from the depths of one’s innermost being and to engage in the fastest practices to attain buddhahood so that one can truly help free sentient beings from the vicious cycle of suffering. This is also why the teachings of Secret Mantrayana, another name for Vajrayana, tell us that loving kindness and compassion for all sentient beings without exception are indispensable prerequisites. Whoever claims to practice Vajrayana without having love and compassion is not being honest and only continues to err. 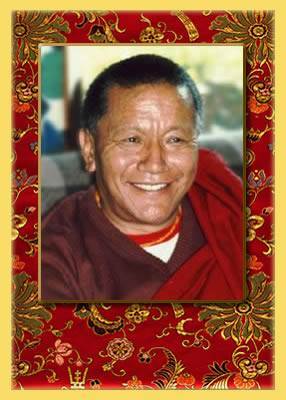 Vajrayana practice is useless without bodhicitta. It would be advisable for such followers to return to the fundamental practices that teach why suffering arises and that show how to develop bodhicitta. One increases bodhicitta by contemplating the suffering that friends and relatives endure until tears well up in one’s eyes. One practices until one reaches the stage of gladly wanting to give one’s own life for their sake. In a former life of Lord Buddha, at Namo Buddha in Nepal, he was moved deeply when he saw a starving tigress and her cubs. Aware of impermanence and death, he knew she and her cubs could not live if he did not help. He gave his flesh and blood as a meal so that she and her little ones would not die. all living beings is indispensable if one even hopes to board the profound vehicle of Vajrayana. Presented at Theksum Tashi Choling in Hamburg, July 2007. Based on the German rendering kindly offered by Thomas Roth, translated into English and edited by Gaby Hollmann, responsible for any mistakes, with sincere gratitude to Madhavi Simoneit and Lama Dorothea Nett.